"I was too young to get married, for years. And I went directly from 'too young' to 'Why aren't you married? What's wrong with you?' There were those 10 minutes in 1992 when I was exactly the right age and weight to be married, but I forgot to set the alarm clock and I slept right through it." Lots of guys consider romantic comedies to be "chick flicks." More often than not, they're some of my favorite movies. There's nothing I enjoy watching more than a really well crafted rom-com (like When Harry Met Sally or My Best Friend's Wedding). I'll even be forgiving to the less than perfect ones if they are able to muster up a bit of charm (Addicted to Love, You've Got Mail). 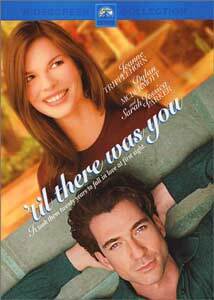 I say this because I want one thing to be clear: my intense dislike for 'Til There Was You has nothing to do with any sort of bias against the genre. Gwen (Tripplehorn) and Nick (McDermott) are made for each other; they just don't know it yet. Their entire lives, from childhood on, have mirrored each other; they've lived just one degree of separation apart for years. Gwen, always searching for true love, has settled into a rather mundane life as a ghostwriter, deciding that if she can't have her own life story, she might as well tell someone else's. At the moment, she's working on the bio of Francesca (Parker), a spoiled former sit-com star, who just happens to own the building that Nick's architectural firm is hoping to demolish. Gwen, looking for a new apartment, just happens to move into said building, where she discovers it was designed by the first female architect in New York (who just happened to be Nick's mentor), and she sets off on a quest to save the historic structure. There are two things that irritate me in romantic comedies: the outlandish coincidence, and the contrived obstacles that keep the couple apart. 'Til There Was You is full of both. Every single character is related to both of the protagonists in some way. It's supposed to be sweet; instead, it's saccharine and annoying. There's also a lot of bumping into old acquaintances and old loves, which, again, is supposed to help the characters gain perspective on their lives, but the forced, sentimental speeches that each character is forced to recite become tiresome rather quickly. And then there's the fact that the entire movie could be over if the characters would just communicate. I call this the Three's Company syndrome. There's also a running gag that Gwen bumps into things a lot; this is so she can fall down and conveniently miss Nick entering a room. The cast is adrift in a sea of bad dialogue and contrived emotion, but they manage to come away without looking too ridiculous. None of the blame can be placed on them(the few bright spots are due totally to Sarah Jessica Parker); it's mostly the languorous direction and sloppy, charmless writing that sinks this one. Aside from a goofy running gag about the way smokers are persecuted in California, there isn't a laugh to be found throughout. And the main love story seems to take a backseat to countless subplots and oddball characters that do little but clutter up the narrative, as they pop in to point out how they connect to the lives of Nick and Gwen and then leave, storylines unresolved. The real problem is this: both Gwen and Nick pontificate about destiny, moments in time, and chance encounters, but other than that, there's no reason that they should be any better for each other than they were for the other people they're shown dating throughout. When the foregone conclusion of an ending comes, it doesn't register as a payoff, because the script does little to build up the moment as destiny, as the momentous occasion it's clearly meant to be. There's a scene, midway through, where two characters sit and watch David Lean's Brief Encounter, another film about chance meetings. Those few moments possess more genuine emotion that the rest of 'Til There Was You put together. You almost wish the characters would shut up and just let the classic play out. Image Transfer Review: Paramount usually delivers on catalog releases when it comes to video quality, and 'Til There Was You looks about as good as you'd expect from a four-year-old film. Colors are fine—many scenes are shot with blue filters, and the look has been translated well. There's some minor artifacting here and there that might've been eliminated if a dual layer disc were used, but really, it isn't a problem in but one or two scenes. Edge enhancement is rarely evident. The print was in fine shape as well, with little visible grain and no obvious scratches or lines (perhaps because the film played in theaters for approximately 13 minutes). Audio Transfer Review: This is a romantic comedy, so you know what that means: the 5.1 track features an active front soundstage and near silent surrounds. The rear channels do kick in to support the score occasionally, but they are more or less mute. Dialogue is anchored in the center channel and sounds reasonably strong and natural. The left and right mains fill out the sound a bit, and a few scenes feature some mild directionality, but nothing impressive. A track that is suited to the film, but nothing special. Extras Review: The sole extra is the theatrical trailer, but on the plus side, chaptering is far better than on most Paramount discs, with a reasonable 36 scene selections. Paramount has produced a fine catalog release, with good image and sound quality and the minimum required extras. The only problem with the package is the movie, which falls flat despite the impressive cast. If you want a good romance about chance meetings, do yourself a favor and do what the characters in the movie do: watch Brief Encounter.